I've had my 3 female Leo's for about 9 years now... kept their tank setup the same for quite a while... it's a 20L tank, with ceramic heating element on top of the tank on the right side, pointing down, with an under-tank heating element also on the right side, below the humid hide. the left side of the tank has a cool hide for them, and there are some driftwood branches for them to crawl around on. Substrate is repti-felt, with a layer of paper towels on top. They have 3 dishes in their terrarium - one with a multi-vit powder, one with water, and the other is food. Just curious - what does your feeding schedule look like for your leos? 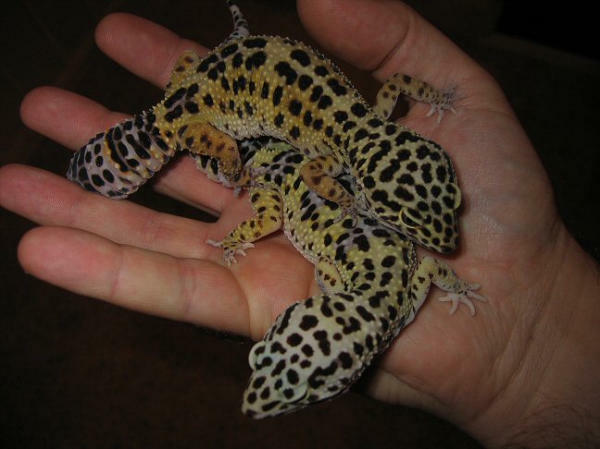 0.3 Leopard Geckos - Lexi and Libby (clutchmates), each about 9 yrs old, and Lilly - about 8 yrs old.